The Amateur Radio Emergency Service® (ARES®) provides emergency communications to "Served Agencies" such as fire and police departments, the American Red Cross, the National Weather Service, hospitals, and others. Many ARES® teams also provide communications for public service events such as marathons, parades, bike riding events, and boat races. Individual ARES® teams are organized at the county level in Missouri. This is the Web site of the ARES® team serving St. Louis City and County, Missouri. 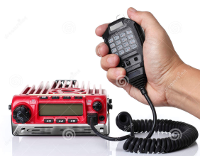 The Amateur Radio Emergency Service® is a program of the American Radio Relay League. "ARES" and "Amateur Radio Emergency Service" are registered marks of and are used on this Web site by permission of the American Radio Relay League. During an exercise or actual emergency, you may need to leave the primary frequency for a period of time. This may be to pass a formal message, make a repair to your station, or simply to take a break. Always let the net control operator know that you are leaving the frequency. When you return to the primary frequency, call "recheck" to let the net controller know that you are back. The next St. Louis Metro ARES meeting will take place at Barnes-Jewish West County Hospital and start at 7:30 PM. It will take place in the Private Dining Room, located at the rear of the downstairs cafeteria. 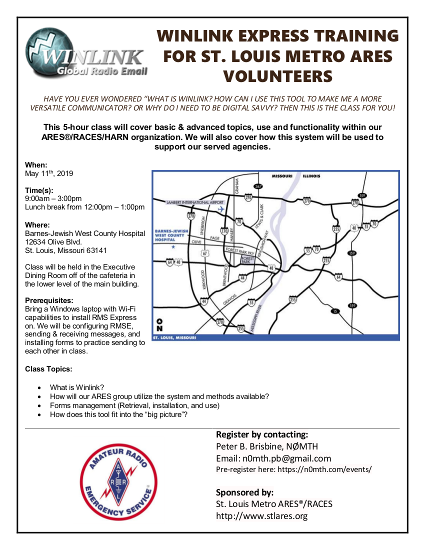 The Emergency Coordinator will discuss the ARRL's recent changes to the ARES program. St. Louis Metro ARES 442.375 MHz repeater is temporarily off the air. It was located at the Bayer (formerly Monsanto) campus, and had to be shut down and removed. Once we find a new home for it, we will return it to service. St. Louis Metro ARES needs additional operators to run the weekly nets. We have rotating schedules so that no operator is burdened with being Net Control Operator too often, but our list of available operators changes from time to time, and currently it is a bit thin. Being an NCO is nothing "exotic", it is an experience that every ARES volunteer should try at least once. We are happy to let volunteers run either of our two Wednesday night nets. You can give it a try just one time, on an irregular basis, or as part of the regular rotation of operators. The net scripts and other information about running the nets can be found by clicking on the Operations -> Voice Operations button in the menu on the left side of this screen. If you are interested, curious, or just have questions, please contact Gary Hoffman at [email protected]. It is very important that amateur radio operators working emergency situations understand how to handle written messages. There are standard protocols and message forms. All of the details about handling these written messages, sometimes called "formal traffic", can be found on our Resources page or via the link below. We urge you to examine this material, then try copying messages read during our weekly practice message net. The weekly practice message net has only two net control operators. If you'd like the opportunity to learn more and actually send messages, even just one time, please contact Gary Hoffman, KB0H. New online application form now available! Click here to display the form on your browser. Fill in the blanks as best you can, then click the "Submit Form" button. A copy will be emailed to us. What will we do in the event of a disaster? Click here to learn about Emergency Support Functions and the role of St. Louis Metro ARES/RACES in emergency management plans. St. Louis Metro ARES® holds a 2 meter net every week (see date and time listed below). All amateur radio operators are welcome to participate. Run the show! We will teach you what you need to know. We'll give you the opportunity to control a net and help you if you have difficulties. See out Voice Net Operations page. Both use the call sign N0ARS. If you haven't been to our monthly meetings you've missed talks and demonstrations on Go-Bags, Message Handling, the Missouri Emergency Packet Network, DC Power and much more. Do you need help building a go-bag? Are you unsure about what to use for emergency power? 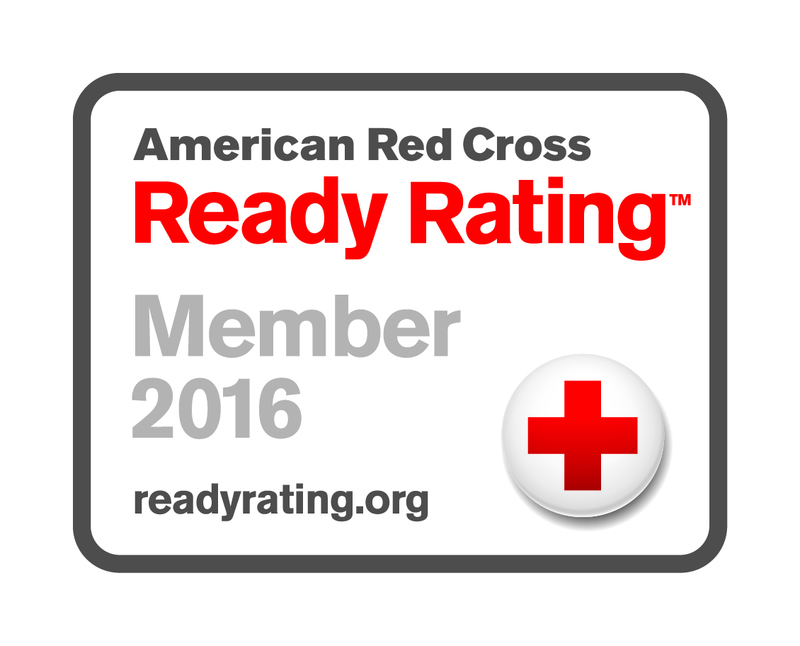 Would you like some information about personal preparedness? We can help. Do you have emergency communications experience or knowledge that you'd like to share with others? Do you have some other skill or talent that could benefit the group? We'd be happy to hear from you. Do you monitor St. Louis Metro ARES® activities? Write to us and we'll send you a QSL card. Click here for more information. The date and location of our next monthly meeting can be found on the Calendar of Events page, along with directions how to get there. Join us in our field exercises and develop your skills. Find out what things you do well and which areas you could improve. Help us to create a robust response team. Licensed amateur radio operators are invited to join the St. Louis Metro ARES® Yahoo group. Yes, we accept donations of stamps, cash, items to sell or raffle, items that we can distribute to our volunteers, and so forth. Immediately following the regular voice net is the weekly ARES® practice message / traffic net. A test message is read over the air to give you an opportunity to practice copying down formal traffic. St. Louis Metro ARES® maintains a 2 meter packet mailbox/BBS. This packet system is a training tool and runs 24/7 for your convenience. If you have packet radio capabilities you are enouraged to sign in on a weekly basis. All amateur radio operators are welcome to participate. 1 - Please see the "Software" section on the Resources page if you do not have software necessary to read these files.